The caprice view is assembled from ruins which are Roman in character. 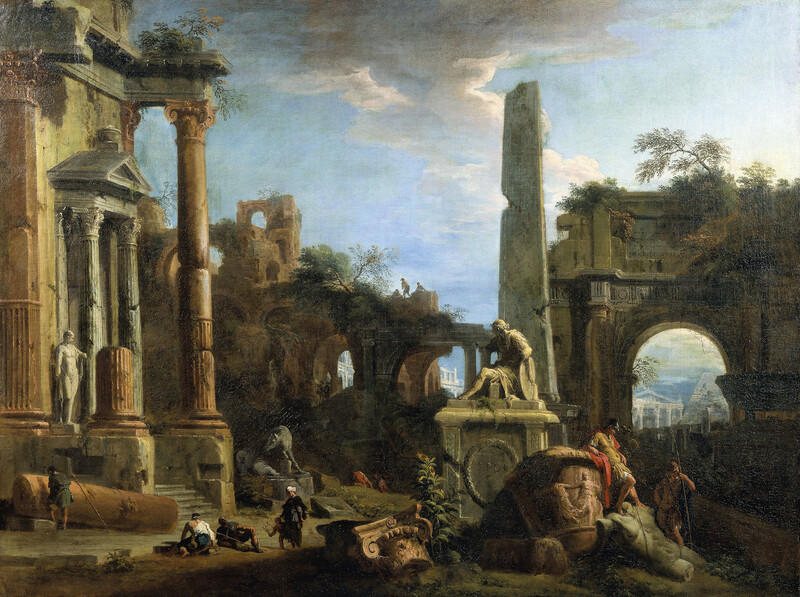 At the left is the ruined portico of a large temple, with a statue of a standing man. Beyond are more massive ruins, based on those of the Baths of Caracalla, with men on them silhouetted against the sky. At the right of the temple is the statue of a wolf, with a child or children (probably meant to be Romulus and Remus). At the centre and right is a statue of a seated man on a plinth, with an obelisk and a triumphal arch behind, based on the Arch of Titus. Through the arch is visible a temple facade. In the right foreground two soldiers are standing on the torso of a statue, at the base of a fallen urn. The urn has a frieze of dancing figures on it and seems rather similar to an unidentified vase that appears in paintings by Panini, such as Roman Ruins with Eleven Figures (National Gallery of Ireland, Dublin). Marco Ricci was the nephew and probably the pupil of Sebastiano Ricci. From an early age he concentrated on landscape, and he also developed a specialism in theatrical scenery design. Marco often collaborated with his uncle, painting the architectural or landscape backgrounds for Sebastiano’s large canvases, or enlisting Sebastiano to paint the figures in his own small landscapes. The major portion of this work is clearly Marco Ricci's, and the 'Italian List' identifies it as his last work. The picture is a work of collaboration; the handling of the two soldiers on the right is clearly the work of Sebastiano Ricci.